The NXP LPC800 series is an interesting entry in the Cortex M0+ microcontroller market, aiming to replace 8 bit microcontrollers at the low end. The largest member of the family, the LPC812 is a device with 16kb flash and 4kb SRAM. 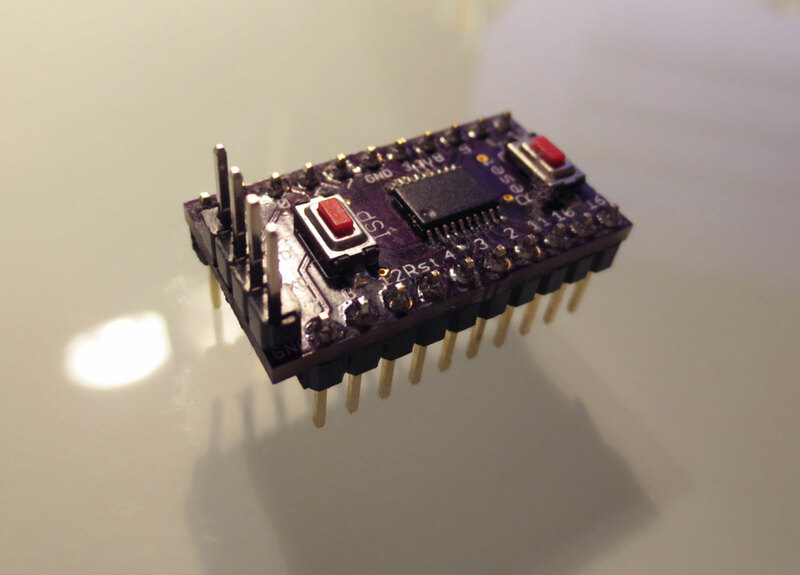 It is available in a TSSOP20 package which is really small, but still easily solderable. Since I prefer to work with microcontrollers with as little added clutter as possible, I designed a small break-out board for this device. The board includes push buttons for reset and activating the serial bootloader. It has an integrated 500mA 3.3V LDO to supply both the MCU and connected devices from the USB port. The four pins on the top side (5V,RX,TX,GND) can be used to connect a cheap USB to serial adapter (<$2 on ebay) and program the device via the internal bootloader using FlashMagic. The entire board with LPC812 is smaller than a DIP LPC1114. Due to it’s narrow design, it is even useful on very small 170 pin bread-boards. The Github repository has all design data. Thanks for this design – ordered some from OSHPark / built / tested / work fine.